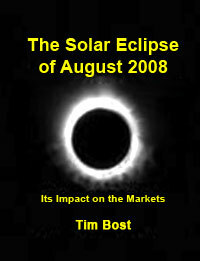 Tim Bost's special research report on the market-moving solar eclipse of August, 2008 provides an in-depth look at this highly stressful and historic eclipse, its astrological dynamics, and its potential profit-making impact on the markets. This massive 59-page monograph was originally prepared exclusively for Tim's preferred personal clients who are actively engaged in the markets. Now that it's being made available to the general public, it's a phenomenal bargain. By the way, don't let the fact that the actual eclipse is now history stop you from getting your personal copy of this comprehensive monograph. The solar eclipse of August 1, 2008 was extremely powerful, and it will continue to have a resonant effect on stock prices and market trends for many months, and perhaps even years, to come! In the pages of this penetrating report you'll find key insights that aren't available anywhere else. It reveals some of the distinctive market patterns that have occurred following similar eclipses in the past. It includes more than three dozen astrological and market charts relating to the eclipse, along with amazing tools for market analysis, eclipse maps, and vital money-making information on dozens of specific dates during the coming months when the residual effects of the March solar eclipse are likely to play out in the markets and on the world stage. There's also extensive data on the specific stocks to keep an eye on for potential eclipse-based trading opportunities, and much, much more! The effects of the Solar Eclipse of February 2008 on geopolitical events and on the financial markets are thoroughly illustrated and discussed in this fascinating e-book.